So, you have a social wall in mind for your event, but you don’t know where to start? We’ve broken it down for you to help maximize the potential of your event and to make sure you choose the perfect plan and wall. This wall is the #1 conversation starter, and is also great for creating event exposure. Our Tweet wall features a feed of tweets that updates in real-time, perfect for events like conferences where you want your crowd to share their opinions and join in on the conversation. Since Twitter is an online information hub, it’s the perfect way to get like-minded individuals to connect and interact. Simplicity is key. This wall shares your event-goers’ favorite captured moments, and creates a sense of community. It is great for events like music festivals and weddings. This wall will display both Tweets and photos (from both Instagram & Twitter) that are captured by your event-goers. 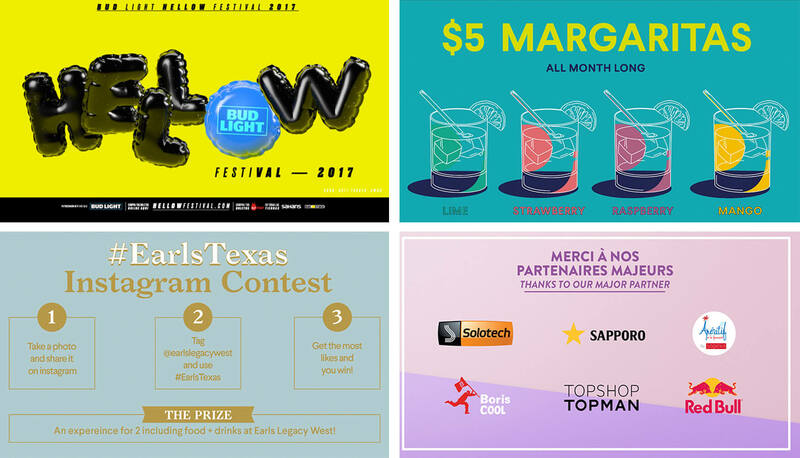 Due to its ability to showcase a combination of posts that are both informational and visually aesthetic; it is effective for every kind of event. It would be especially fitting for conferences, food festivals, and sporting events. Our unique Mosaic wall allows the display of up to 8 photos at once, with an option to add a customized foreground image, giving your event an added personal touch. This wall is best used when your event-goers have tons of pictures to share. It’s like having an Instagram feed on the big screen that are heavy on the visuals. Sponsorship: A good way to create leverage for your event is to include sponsors. This gives your event more credibility, and also gives your sponsors exposure to your audience. Win-win. Schedule: This is great for busy events. Having an agenda displayed will make sure your attendees know what’s happening and when it’s happening throughout the event. Tips and reminders: Image screens that include information and/or reminders are especially useful if you don’t want your attendees to miss out on any valuable affairs that are happening as the event takes place. This is the easiest way to display announcements, and it will also help your event run without any mishaps. Promotions: This is the easiest – and most practical – way to let your attendees know about any ongoing deals. Maps: Incredibly useful in helping attendees get around large events, such as music festivals and conferences. Contests: Why not incorporate a contest into your wall? This will definitely create buzz among event-goers, and it will simultaneously increase engagement rates. Our video wall allows you to feature any video of your choice. A good idea would be to preview past events, and even sponsorship videos! This would be a great inclusion for festivals and sporting events to help build up your event and bring it to life. A little something extra never hurts. Every wall conveys a different message, so make sure you choose the right wall or even a combination of walls to brand your event as you envision it, and get the engagement it needs! And make sure to always keep your audience in mind when building it.